Ray Bradbury died on June 5, 2012 at the age of 91, he is considered by many to be one of the great writers of our time. His best-known works include Fahrenheit 451, the Martian Chronicles, and our favorite, The Illustrated Man. The Illustrated Man was first printed in 1951 and was a compilation of 18 short stories by Bradbury, including the short story, The Illustrated Man. To show the power of Bradbury’s writing, this book of short stories is still in print today. 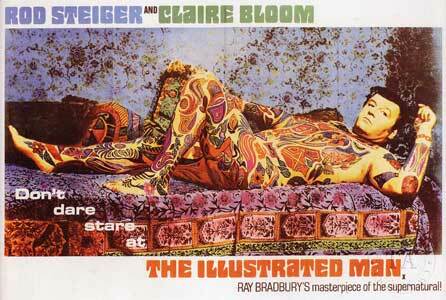 The particular story of The Illustrated Man was made into a movie in 1969. 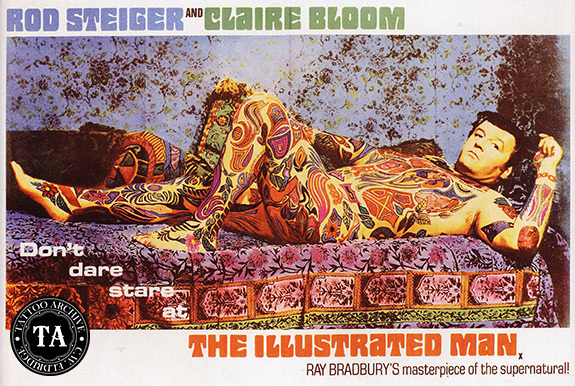 The movie was based the book and stars Rod Steiger as the illustrated man and his then-wife Clare Bloom as the tattooist that covered Steiger’s body with images that come to life when stared at. Howard B. Kreitsek wrote this screenplay by taking three of Bradbury’s stories, The Veldt, The Long Rain and The Last Night of the World and weaving them together into a sometimes-disturbing view of the future. The critics at that time were not kind to the movie and it was a flop at the box office. Time Magazine movie critic wrote, “Responsibility of the failure of The Illustrated Man must fall with Director Jack Smight. He committed every possible error of style and taste, including the inexcusable fault of letting Steiger chew up every piece of scenery in sight”. Chewing up the scenery was a complaint that Rod Steiger often encountered in his long stage and screen career. The Illustrated Man has numerous possibilities for an abundance of great pictorial promotional items that can be added to your tattoo collection. 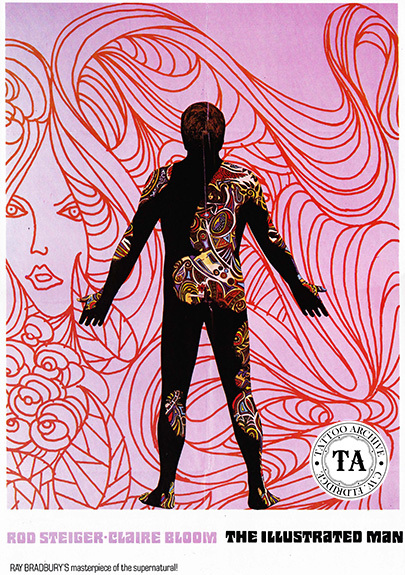 Most of the posters and book covers have fanciful interruptions of what the illustrated man’s tattoos looked like. Throughout the years the paperback copy of the book has seen more than a dozen different covers with clever artwork depicting the illustrated man. We have seen several different posters for this movie, the audio book in cassette format, had it own unique painting of the illustrated man that looked like a side- show banner. There are several movie stills showing the award winning make-up that took hours to apply by Gordon Bau and his team. With the latest DVD release there is a short film titled “Tattooed Steiger” about the making of the movie with some footage showing the process of applying the tattoos on Rod Steiger’s body. Included with this article are but a few of the great collectables connected to Ray Bradbury’s The Illustrated Man book and movie.